Bing SEO Tips are not much different from Google, but some elements require additional attention. In this blog post, I’ll share what I’m doing for The Stadium Reviews (a new website) and how Bing and Yahoo are part of my focus. The primary tool I’ll be using is Bing Webmaster Tools which is free to use. Bing Webmaster Tools is equivalent to Google Search Console, but the data is from Bing and Yahoo. If you are looking for help, I’m an SEO Consultant that can assist with your strategy. There is no B.S spin with this picture above, Bing powers 11% of the U.S search market share. The way Bing powers 11% is that their search engine powers Yahoo, DuckDuckGo, and MSN. Searching on those search engines uses Bing’s algorithm, so your reach expands from bing.com. The first thing you need to do to improve your Bing SEO is to perform a site search on Bing. To drive traffic to your site, you need to be on Bing. Above is the site command to use to discover if Bing has your content in their search results. As you can see, Yahoo will have the same content as Bing since it’s Bing algorithm. You may see a slight difference in some rankings, but the results will almost always be the same. Each morning, I use Bing Webmaster Tools for the following optimizations. I submit my pages each morning to Bing since their tool now allows 10,000 submissions daily. Second, I review the SEO Report to see if there are any quick technical optimizations I can perform. Third, I review the keywords that are driving clicks and impressions to my site and I optimize my content to improve their rank. I use Screaming Frog for my clients to export their URL’s for Bing to crawl. Bing recently made an update to their tool to allow 10,000 URL submissions daily when your account hits a certain threshold. The threshold is having Bing Webmaster Tools for (X) amount of months to limit spam. As you can see above, my new website can have 1,000 daily submissions, so I make it a habit to have Bing crawl my site often. If you want to learn more about how to submit URL to Bing, you can check out that link. One feature to help improve your Bing SEO is the index explorer section. Bing will illustrate your site’s architecture which is a core ranking component of their search engine. Having a clear architecture will help Bing find and discover your content to rank. When you click into individual pages within the tool, you will see the discovered and last crawl section. What important to know about this is when Bing first found your page and the last time they crawled it’s content. If you make additional changes to a specific page like adding more content, you should check to see when Bing last analyzed the page. If you want Bing to crawl that content with the new updates, you will use the Submit URL tool above. A ranking factor for Bing is the cleanliness of your XML sitemap. 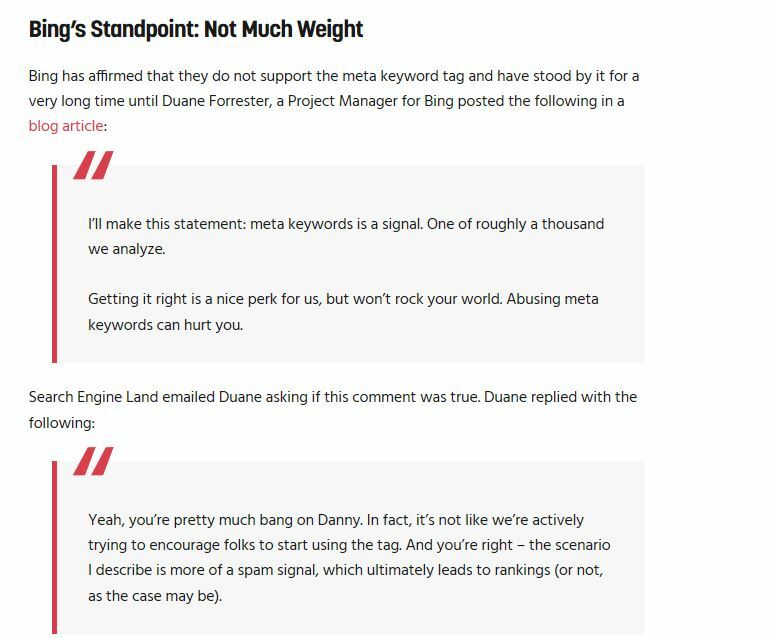 Stone Temple has a great article around Bing that had Duane Forrester state that Bing’s algorithm does not tolerate dirt in the sitemap. Submitting your XML sitemap to Bing gives their bot direct access to the most critical pages on your site. If you want to learn more about how to fix a dirty sitemap, you can check that link. Every two weeks, Bing runs an SEO audit of my site in Bing Webmaster Tools. The report can uncover many issues for people who are new to SEO, so your list may be longer than mine. One neat feature of Bing Webmaster Tools is that when you click on the SEO suggestion, Bing will tell you what the issue is along why it’s important to fix. I found this report very useful when I first got into SEO because it’s essential to understand why something is important to fix for organic success. While these numbers above may seem low, my site has only been around for a month or so. I review the search keywords report because I can see what keywords are driving clicks and impressions to my website. One way I use this data is to see what keyword is ranking, review the page that the term is on, and work on improving it’s search position. There are many ways to improve a search position, but one simple way is to include that keyword phrase directly into the page since Bing favors exact match queries more than Google. The inbound links section within Bing Webmaster Tools is a hidden gem. No surprise here, but the only external links that point to my new website are from TM Blast. I’ll use this data in the future when my new site increases it’s backlink profile to see how people are linking out to the domain. Bing provides a visual of your growth (or decline) of links, so it can be a good idea to monitor this and see if there is a connection between rankings and links. Now that we have seen how to use Bing Webmaster Tools, I want to share additional Bing SEO tips to improve your performance. Bing places weight and consideration into your title tags, so it’s critical to include them on every page. Having ALT tags for your pictures will help boost your image performance on Bing as well. An ALT tag tells Bing’s bot what the picture is about, so image optimization can drive additional traffic to your site. While I don’t recommend using Meta Name Keywords, Bing has been on the record stating that abusing this tag can hurt your performance. If you stuff meta name keywords on your pages, Bing may devalue your site. After reading how to improve your Bing SEO, you may be wondering where Bing exists. Bing is the default search engine on Internet Explorer and Microsoft Edge. Bing’s presence is primarily on desktop computers, so anyone using Internet Explorer and Edge will default to Bing. Here is the breakdown above of the market share in the Untied States for these two browsers. As you can see above, Bing would be on 18% of all desktop browser activity in the United States which may surprise many people. Cortana is part of Microsoft’s strategy to get more queries through Bing. Microsoft Cortana is in each Windows 10 device which has over 800 million installs, so that opens up Bing’s reach. Every Cortana search result defaults to Microsoft Edge, so that is how Microsoft is building the market share of Edge. Cortana is also on iOS and Android devices, so that is how Bing is growing their mobile presence. While Bing is not the default search engine on iOS and Android, Bing does have considerable weight on desktop devices.